This blog is about interesting sea life that has been sent to us by SeaLifeBase. 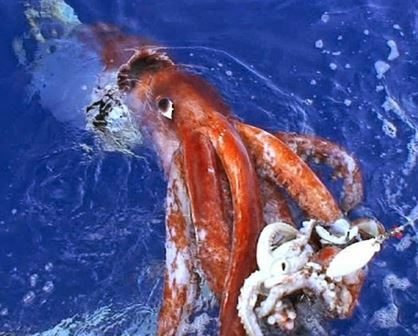 The one is about “Ocean Giants: Giant Squid”. You can become a SeaLifeBase collaborator. WHAT is a “SeaLifeBase collaborator,” and WHO can be one? 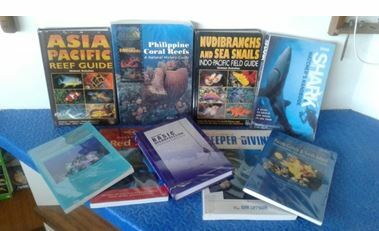 In a nutshell, SeaLifeBase collaborators are the people who help us by: a) sending or alerting us to references and photos, which we have not yet used; b) assembling data from published sources using a preformatted template; and/or c) verifying or correcting data that we have extracted and incorporated into the information system. Some of them are — but not limited to — biologists, taxonomists, scientists, and other experts. Some are aquarists, photographers, businessmen, and marine-life enthusiasts. Truly, we welcome contributions from anybody who has a passion for marine life. 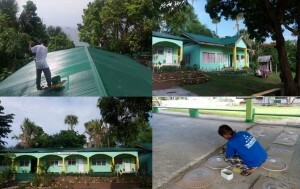 Last week we had 9 painters go over to Verdi Islands’ San Agapito Elementary school to paint the roofs green in a charity ride sponsored by the Perth Australia Rotary club Subiaco – District 9455 president Geoff Down and co-organized by El Galleon. 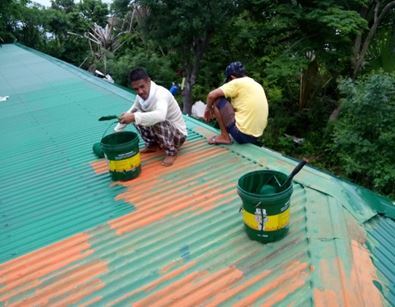 It was to have been a ten day job, but after hiring three more guys over at Verdi and with the kind donation from Rene Sten of the amazing corrugated roofing paint rollers, it took just three days! Riza Ebora headmaster was so thankful and surprised with the job, she took loads of photos and sent them with lots of thanks. Next week we are sending twenty orbital fans along with a real electrician to install two fans in each of the classrooms and admin office. We would like to take this moment to thank the Subiaco Rotary and in particular Geoff Down and our own Paul Jones for their help in making this happen. El Galleon and Asia Divers were out there again this week. 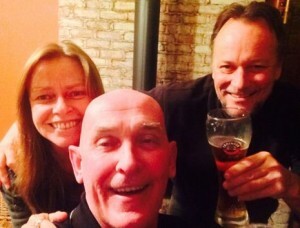 This time we were in Baco where we had 320 families turn up. With the money we raised for Mohawkvember and a few other donations from some generous friends of Asia Divers we managed to get an array of food items to be handed out. 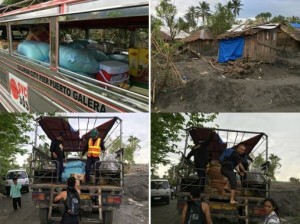 The organization was fantastic with the staff at El Galleon working hard to bag the food for each family and the organizers in Baco making sure that no one was left out. Without these dedicated people none of this would be possible. They are the ones that make your donations count. We thank everyone for all of their support. 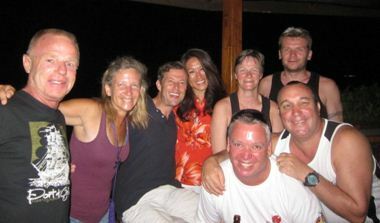 We at El Galleon and Asia Divers have always supported charities of one kind or another. Rhuby our manager of El Galleon has traditionally donated a month’s salary to kids or for disaster relief each year for the past few years. 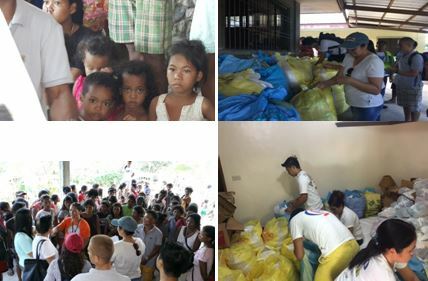 Last Saturday Rhuby, Kjell and Allan put together enough of their money to provide 200 food bags for two hundred Mangyan families from Naujan in Barangay Aringan. 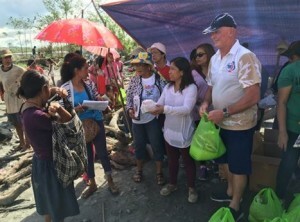 During the last typhoon these people and hundreds of others were displaced after a hug wave of mud and water swept through their valley killing many and making homeless hundreds of others. 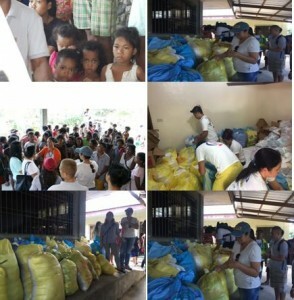 Unable to find support and relief from government agencies, these people were left abandoned, helpless and hungry. You can only understand the magnitude of this devastation by going and standing in the middle of this valley. The drive towards this valley is obstructed by downed power lines, mud washed roads, homes with mud half way up there broken walls, coconut trees up-routed like weeds, trees that are over a hundred years old up-routed and washed a hundred or more meters from where it stood for so long. We are calling out to anyone who can help to please send us a pledge or cash as we intend to go back to Baco another area close by hit hard by the last typhoon that went through the Philippines. 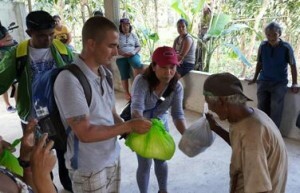 There are over four hundred Mangyan families homeless and in need of help. Allan has pledged again enough money for a hundred families; through the great efforts of the instructors and friends during the November “Movember” drive there is enough money for another hundred families. We are looking at making this donation next week, Friday the 22nd of January. Many thanks to all those who donated and the El Galleon staff, Jamie from Asia Divers and Lina for helping us during the Naujan distribution. And a very special thanks to Lina Soderstrom again who coordinated the purchasing and packing of all these bags. And also a very special thanks to Mangyan teacher Sonya for her amazing job of coordinating and distributing the food bags and supplies on the day to all the two hundred families. 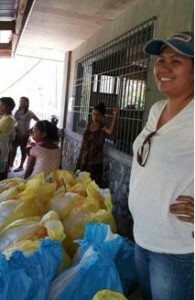 We met every family and personally handed over each bag! Please contact admin@asiadivers if you would like to help. 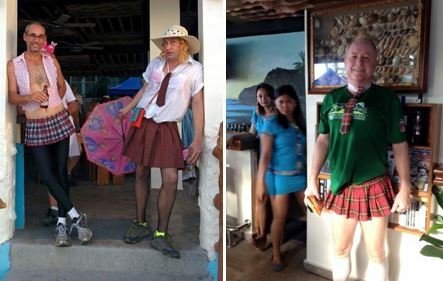 The Puerto Galera Hash Club is always something fun and interesting to do on a Saturday afternoon. 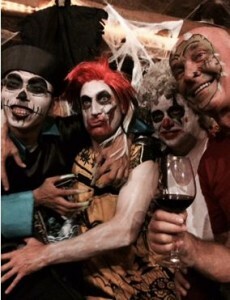 It gives the boys a chance to show off their frocks sometimes! Time to dust off the stairs! 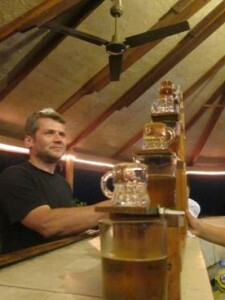 Markku is contemplating the next few minutes of his life as the “stairway to Hell” has been prepared for him. 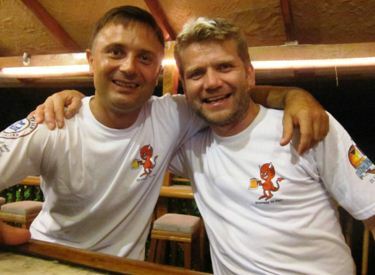 Art Kotula and Markku Tapani Saari climbed the “Stairway to Hell” and got their victory t-shirts. Fun times in and out of the water with Kjell, Pete, Troy, Alli, Markku & Eva. Here giving a big Congratultions to Nick Carpenter for getting his Rescue cert and to Chigusa Shimada for getting her Advanced and Nitrox certifications. Well done! Allan has been busy going around Australia visiting many dive shops and also fitting in time to see some old friends like Eric Masters. 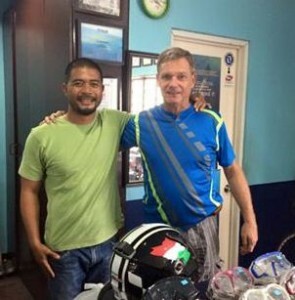 Tommy has been on tour around Eastern Philippines and visiting some Dive Shops/Centre’s that don’t often get visited by suppliers. Here is Tommy and Vladimir Elazegui from Scuba de Oro in Cagayan de Oro, Northern Mindanao.